It’s summer. The kids are home from school, and they’re hungry all the time. That means I run out of food in the house quickly. Yesterday morning, I got the bright idea to try to deep fry my own donut holes. I wasn’t ambitious enough to try actual donuts, but I thought it would be easy enough to fry up little balls of sweet dough. Turns out, I was slightly wrong. First of all, I didn’t have everything I needed exactly to make the exact recipe online. Second, I didn’t really understand what I was doing (since it was the first time I’d ever tried to make donut holes), so this was a totally new experience for me – a bit of trial and error. Probably more error than trial. Here’s basically what I used/did. My modifed donut recipe. It was supposed to be quick and easy, but I didn’t think it was. Mix together the vinegar and milk and let sit for about three minutes. In a medium-sized bowl, cream the butter and 1/2 cup sugar together until smooth. Beat in the egg and vanilla and blend well. Pour in the flour, baking powder, salt, and salt. Pour the vinegar and milk mixture into the flour/butter/egg mixture and mix well. Form the dough into one large ball and break off into smaller balls, rolling the dough in your hands to form the donut holes. Cover the donut hole dough balls and let sit for about 10 minutes. Heat oil on the stove in a large, deep frying pan or pot to a temp of 375 degrees F (190 degrees C). Fry the donut holes in the hot oil until golden brown, turning over once to ensure even cooking on both sides. Dust with sugar of your choice while the donut holes are still warm. And here’s what I think I did wrong. I think I had too much liquid and not enough solid because the batter I got was basically the consistency of pancake batter. 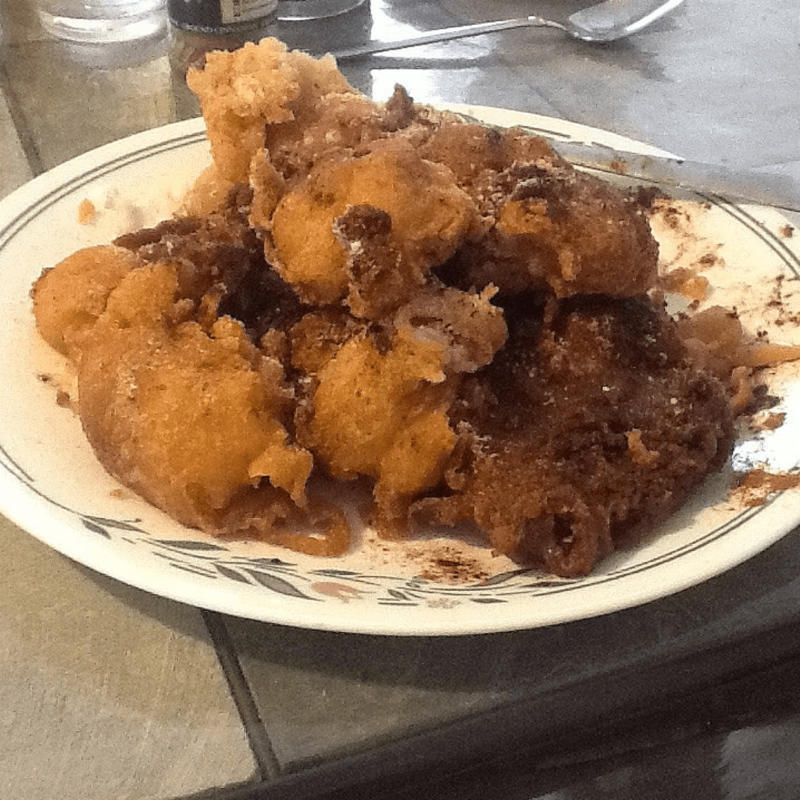 Note: DON’T try to deep fry pancake batter and expect to get donut holes. It’s not going to work right. Maybe if I had used regular milk instead of coconut milk, that would have helped. Or maybe I should have used more flour. I’m going to try that next time and see what happens. Also, the original recipe used shortening. I switched it to butter because that was what I had, and I didn’t think it would make that much of a difference. I could have been wrong about that. I affectionately call these my “donut blobs.” My six-year-old said they were “Yummy.” I thought they weren’t bad…just a little on the oily side (and not at all how I’d hoped they’d be). My four-year-old wouldn’t even touch them. And my husband liked them, but he commented on how the batter must have been too thin because they soaked up so much oil. I told him I thought the batter was too thin also. I guess that should’ve been my first clue to not try to fry them like I did. Anyway, there’s always next time. I’ll report back on how my second experiment goes with these. Stay tuned!